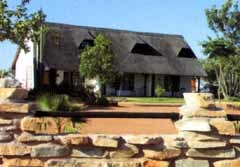 Ermo Game Farm is situated 550 km north-west of Windhoek between Damaraland and Kaokoland, bordering on three sides on the south-western end of Etosha National Park. ERMO - stands for European luxury combined with unspoiled African landscapes, offering 11 comfortable bungalows for guest accommodation - each providing an impressive view of the game-rich farmland. 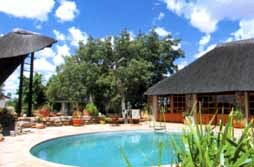 Guests can relax at the refreshing swimming pool and enjoy the tranquility of their thatched-roof accommodation and learn more about life in Namibia in entertaining company on the generously designed lapa. The magnificent natural splendour of a Namibian sunset can be experienced in a lodge-similar construction and, especially, after the game drive in an open safari vehicle through the Mopane savannah on the farm, on the plateau on top of a hill with a spectacular panorama view including a game water point and the western part of Etosha National Park. It is possible to camp on this hill under the star-studded sky in the midst of African nature and Ermo’s warm hospitality. The camping site is equipped with showers and everything that is required for a comfortable stay. The small lapa is paved with natural stone and equipped with a fireplace for long romantic evenings. The illuminated waterspot is situated not far away from the guesthouses and lapa, providing enjoyable entertainment in the evening as kudu, eland antelopes, Oryx and zebras come “for a drink at the bar”. Sigi Schreiber and her mother Regina spoil their guests with culinary Namibian game specialities and highest standards of personal service. Informative and, sometimes, serious or entertaining discussions arise. Like many other farms in Namibia, Ermo also has a repertoire of entertaining talks which are created by the people present. Anecdotes and stories are part of the social life on Ermo. Holidays are not always as long as one would like them to be. Ermo can provide a 6-seater Cessna aircraft with a pilot. A flight across Damaraland and Kaokoland to Epupa Falls on the Kunene River is an impressive experience and Omarunga Camp near Epupa a small paradise set in contrasting landscape. Memorable visits to the Himbas - one of the last primitive peoples and cattle-breeding semi-nomads in Namibia - are possible.